Ah, thank goodness for Mojo Monday. And new dp. And big, fat ribbon. And jewels. 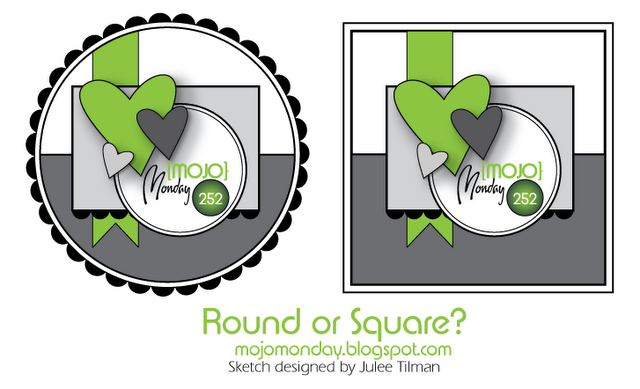 This quick little card used this week's Mojo Monday sketch. It's square or circle week. Let's just say I didn't have to think too hard about which one I was going to do. Hello beautiful corners! I pulled out some more of the new dp that arrived on my porch this week. This new stack is from Echo Park and I am smitten. I mean, really. Look at that scalloped dp!! Love! I want to use it all, and yet I want to hoard it so that I never run out. I die cut and stamped a few flowers from Verve's Joyful Blooms and the sentiment came from another Verve set. Mix and match! I went a little crazy with the jewels and my copics to help them be just the right shades. But I love the sparkle and pop they give the card. And I haven't even mentioned the woodgrain chevron dp yet. Swoon! That's all for today. Thanks for stopping by!